NAMJUNG, Nepal (CNS) — “Sir, because of luck, we all survived. But, we may die of hunger,” Mithuram Pariyar said when a church relief team arrived after a four-hour drive from Kathmandu. “Nobody (relief worker) has set foot here in two weeks,” said Pariyar, summing up the travails of 29 families. 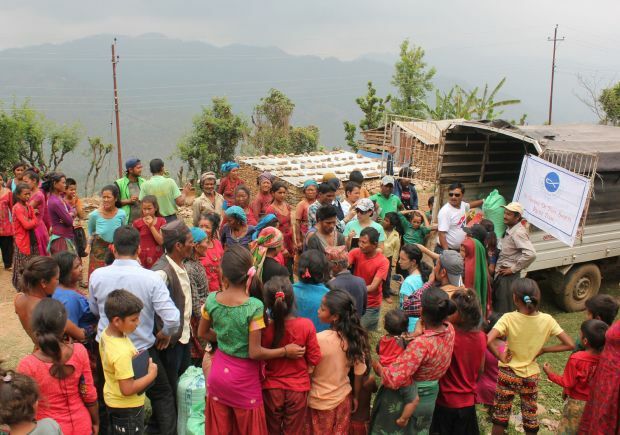 It was this neglect that prompted the St. Vincent de Paul Society of Assumption Parish in Lalitpur to carry nearly 1.5 tons of rice and other food items along with shelter material to the mountain May 9. The route included five miles of a rocky and slushy steep climb that would test anyone’s driving skills. “It was painful for us to see helicopters dropping food on other (nearby) mountains regularly. But nothing (no food) was dropped here,” said Suba Pariyar, holding the arm of his mentally challenged son. Jennifer Hardy, Asia communications officer for Catholic Relief Services, said (CRS) for Asia, said the situation in remote villages was “very challenging. “We are racing against time to cover at least 15,000 families before the rains come,” Hardy told CNS. “The relief has to reach the people in the remote mountains before the monsoon sets in. “Once the rains come (in early June), no vehicle could go up these mountains,” Hardy reiterated. She spoke while awaiting tractors carrying relief material for distribution among 360 families who had converged on the Namjung hills. After hours of waiting on the hill — a two-hour mountain drive from Gorkha, where the CRS has its operational base — the CRS relief distribution team received frustrating news. The tractors carrying tarpaulin and woolen blankets to be distributed among the families was stuck along the path due to the previous night’s rain. “The tractor carrying tarpaulins is yet to come. It is most crucial for the people. We have to wait,” Farhad Ali, a Muslim coordinating the CRS relief distribution on the mountaintop, told CNS when asked about the delay. “All the houses in this village are unlivable. Some have collapsed and others will collapse when monsoon comes, if not in tremors. We are living in the open,” said villager Bhuminand Dhahal. “I built this house with my savings from living in Delhi for 20 years. All that has gone down now. We are happy that at least this group (CRS) has come here and is taking serious interest in helping us,” said Dhahal. By May 14, CRS had distributed relief kits to as many as 5,200 families — more than 26,000 members. But needs remained great: The April 25 quake killed more than 8,200 people and destroyed or damaged more than 550,000 homes in the Himalayan nation.